First of all: kudos to you for even thinking about doing this. The way I look at it, this means that you’re exploring your options to improve your visibility on Facebook, which is a very good idea. Using a contest, giveaway or other mechanism that encourages people to like your Facebook page in exchange for something has a lot of appeal. It leverages the power of something free (or the prospect of being a big prize winner) to get people to take an action that they might not otherwise have taken. It also gives your existing audience something fun to participate in—especially if you invite them to share the opportunity with their friends. This all seems like a very good idea. Unfortunately, however, given the current dynamics of Facebook, using this method to “build likes” on your page could end up really hurting your page’s visibility in the end. How Could Having More “Likes” Actually Reduce the Visibility of Your Facebook Page? I’ll admit, this seems counter intuitive at first… maybe even downright crazy. I mean, the idea of having more “Likes” on your page is pretty much like having more “subscribers” to your content, right? Well… except for one thing: engagement. You see, as Facebook’s user community has grown, more and more businesses like yours who are all hoping to get the eyeballs of Facebook’s users on their content have jumped in. And herein lies the rub: Facebook can’t show everything to everyone all the time. And like I always tell our clients and the businesses we train: we would all quit using Facebook if it became less interesting to us. So… in order to properly show each and every Facebook user the content that is most likely to be interesting to them each and every time they visit the site or open the mobile app, Facebook has to make an educated guess. That’s why engagement is critical. Facebook is measuring this activity all the time… for every single user. And if your page’s content is shown to John Doe without him taking one of those 4 actions, Facebook will eventually stop showing it to him. Thus… your content must get engagement from users in order for Facebook to continue to show it. Many page managers have begun to realize the importance of engagement. And this is where we can sometimes chase new users in search of higher engagement numbers. But think about this for a moment. When you give something away like a prize package that has little to do with the day-to-day content you’re posting on your page, then the reason why people “Like” your page is disconnected from your real content. When that disconnect occurs (and it can sometimes be very subtle), these people will not engage with your content going forward. Your Facebook page is humming along at 500 “Likes.” You decide you want to increase this number. So, you put together a nifty prize package and set up a Facebook contest so people can enter it. Your prize includes: dinner for 2 at a nice restaurant nearby, a Starbucks gift card, and 2 movie passes. Sounds like a great prize package, right? Who wouldn’t want to win that? The prize is interesting to almost everyone. After all, who doesn’t like to eat out and catch a movie with their signficiant other or even a good friend? Since the prize package is universally interesting, you imagine that more people will “Like” your Facebook page in order to win. This is a reasonable assumption. With some good copywriting, some nice graphics, and maybe even a little paid promotion, you should get a lot of traction on this. And herein lies the rub: for all the people who might want your prize package, what percentage of them even own a pet? How many of those people own a dog? How many of the people who own dogs are having a training problem they need to correct? If you’re like me, you’re watching those percentages get smaller and smaller and smaller. Therefore… once these people “Like” your page, how often do you think they’re going to “like” your posts? Or comment on them? Or share them? Or even click on them? Thus… your engagement is very, very low for these newcomers. And… when the percentage of people who engage with your content on Facebook goes down, the visibility of your content goes down. Suddenly all the people who were interested in a date night—but not in training their new puppies—become an anchor that weighs your page down. And there’s no way to get rid of them. Unlike the “Friends” you have in your personal Facebook profile, which you can unfriend at any time, there’s no way to kick out the disengaged people who at one time “Liked” your page. As engagement becomes more and more important on Facebook—and this is happening every single month right now—your ability to keep your followers interested in your content becomes more and more critical. So… with that in mind, what do you think? 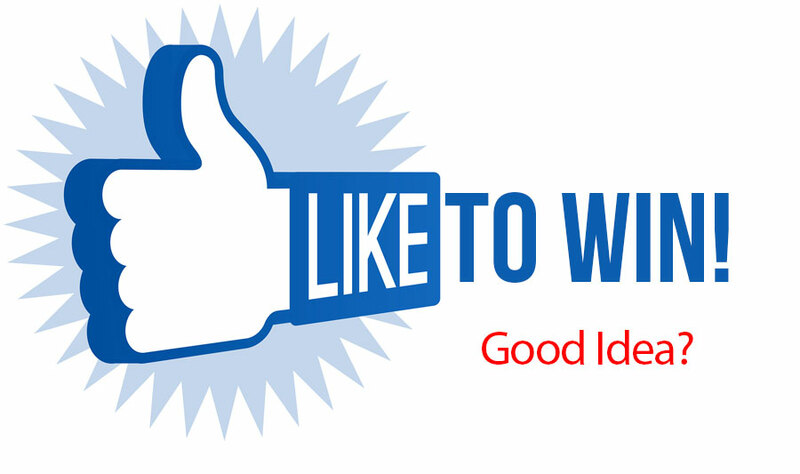 Should you run a Facebook contest to grow you page’s likes? Great stuff to consider here! Do you think that it might benefit you if you’re running giveaways for products that are directly related to your business and page? Since we’re trying to grow fans of our candle line, we always run candle giveaways, making our entrants people who are interested in our type of product. When there’s a strong connection to your product or service and the prize package is highly focused in a way that your best customers are the ones most likely to want the prize package (when others might pass it over), a contest can be a really, really good idea. I’d try to focus on the making the content associated with the contest as engaging as possible (i.e. likely to be commented upon and even shared) so that the activity around the contest enhances the overall engagement on your page rather than reducing it. I only say this because sometimes the entry method is disconnected from the page content (in a tab or “app” instead of using page posts directly), and I’d be concerned that might take away from page engagement. With that little caveat in mind, you’ve got a great train of thought going here!